President Ilham Aliyev of the Republic of Azerbaijan...May not be competing with Russia, but can his country deliver EU from the Russian Monopoly? 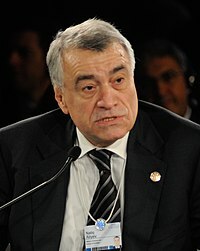 Natig Aliyev, Azerbaijan's Energy Minister...A strategist in Government. For years, Europe has been experiencing energy crises due to Russia's inconsiderate demand to own and control pipelines in the EU territory, which was counteracted with the Union's Third Energy Package. Lawsuits were filed with the World Trade Organization which further fuelled the deteriorating oil and gas security in Europe. Taxpayers' monies have been put into new interconnectors as a contingency plan in case, Russia ever cuts off their supplies, which is quite possible given the history between the two regions. .....as they vow to cooperate with the rest of the world to contend for the liberty of mankind and protect our civilization. Nabil al-Arabi, Arab League Chief...but how seriously serious is the Arab League about joining the global army of Liberty and civilization? CAIRO, EGYPT: Rising from their just concluded meet in Cairo, Egypt, States that make up the Arab League, some of who no doubt, have been using their petro-dollar wealth finance violence across the globe in the name of jihad, and living extravagant lifesyle of the satanic nature, flaunting their ill-gotten wealth all over the place, in the West and at home, disrupting traffic in Western cities with their obscene-exotic cars, whilst their people have a rendezvou with abject poverty at home, had through their foreign ministers last Sunday, vowed to join the West's Chariots of Liberty and Civilization to do battle with the monstrous and satanic gang called ISIS. As President Obama and Congress consider their next move on the crisis in Iraq, they must take into consideration the cost to the U.S. and American taxpayers when our nation goes to war. Do your children speak software? Sir, I've seen many articles that insist coding and computational thinking should be the building blocks of the UK’s IT curriculum. While this is true, it might not be enough, unless combined with the practical application of coding. This means teaching children how to use technology to solve physical, real-world problems.